“I’m a busy Mom of 1…” ? So if you have one child, are you less busy? Not busy? Not busy enough to warrant being able to complain about being busy? As an infertile hopped up on baby-making crack (a.k.a. ovulatory stimulants), you damn well know when I first saw this sign, I did not see the McDonald*s logo, or even, the fat-riddled sausage sandwich. I thought it could be a message from God himself. I so, so, so hope that it IS a sign just for you!!! This is a really appropriate question for me today because I took B and M out today for the first time alone! We just went to a friend’s house.. but wow. I had no idea things would change this much. And let me preface this by saying that compared to B, M is a piece of cake. But still, wow. I started preparing LAST NIGHT to get out of the house and be at my friend’s house by 10am. Last night I packed the diaper bag, and laid out clothes for the three of us. I also got most of lunch made (which I was bringing today, because I’m insane).. so that was a big salad, homemade vinaigrette, chopped tomatoes, chopped mozzarella, etc. I didn’t even get into bed until after 1. Then I had to start getting ready to leave at 7am! B had to eat, M had to eat (twice), I had to get ready, they both had to get ready, I had to grill some chicken, stick a snack for B in the diaper bag, make sure she had her cup and a movie for the car (MUST HAVE), and so on. I started getting them into the car at 9:15 and we didn’t even leave until 9:45. B was screaming from the garage because she couldn’t hear the movie, while I was inside changing explosive poop while the car was running, phones are ringing, head is spinning.. and it just went on and on.Like I said, I had NO IDEA how much more difficult things would get, especially with a baby so much easier than Briley ever was! I would have also taken this as a sign from God!!! ha ha! maybe it is??? I actually think that could be serendipitous, but I’m a sap that way. lol. But consider the source, this is coming from someone who when I was having my miscarriages and in the throes of TTC, I would swear it was a sign from god when I’d see a Preggo pasta sauce commercial. I’m totally serious. As far as the busy mom thing – sigh – I think we’re all busy. But there are different levels of it and so much of it has to do with your temperament, their temperament, age spacing, your ability to multi task. I could go on. 😛 I will just say that I thought I was busy with Sofia but obviously look back and think differently now. It’s all perspective. 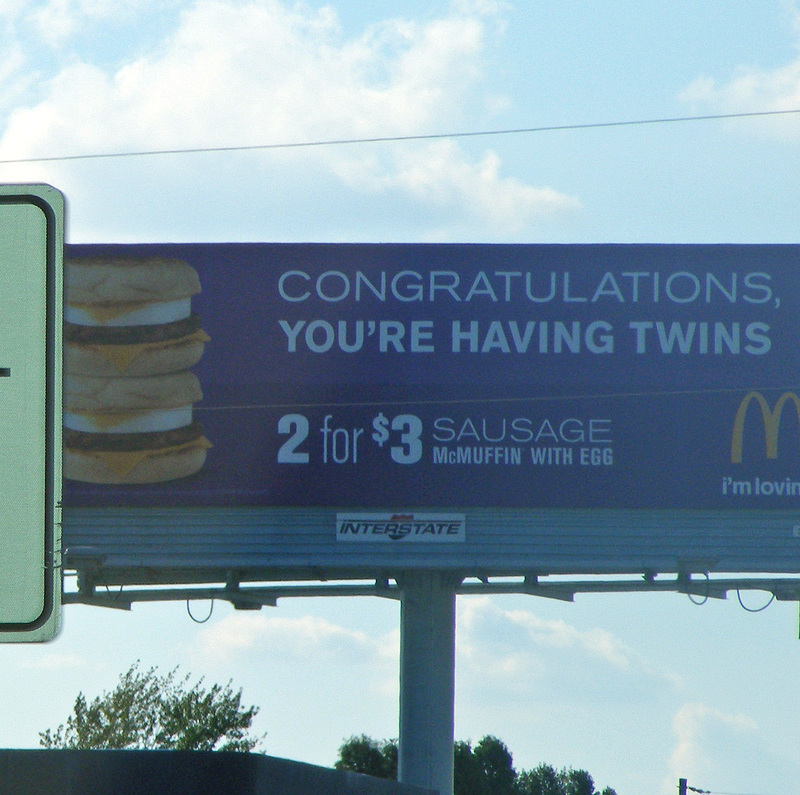 I love that God speaks to you (or rather sends good news your way) via McDonald’s billboards!